I have, of course, been to Sandia Crest before. 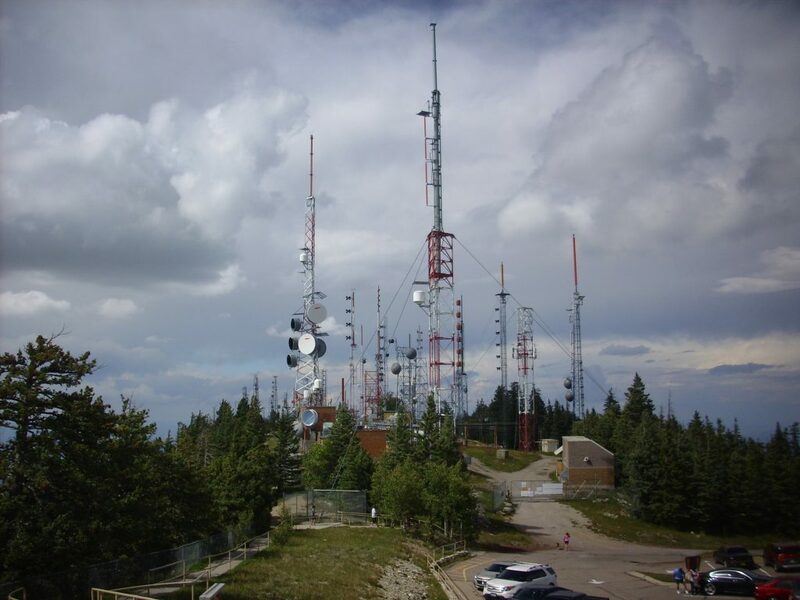 I used to live in Albuquerque, and one of my dates with Cindy was to hike to the crest from Doc Long campground. But it had been some years, I was in Albuquerque to take Nathan to a smash tournament, and I felt like exploring. 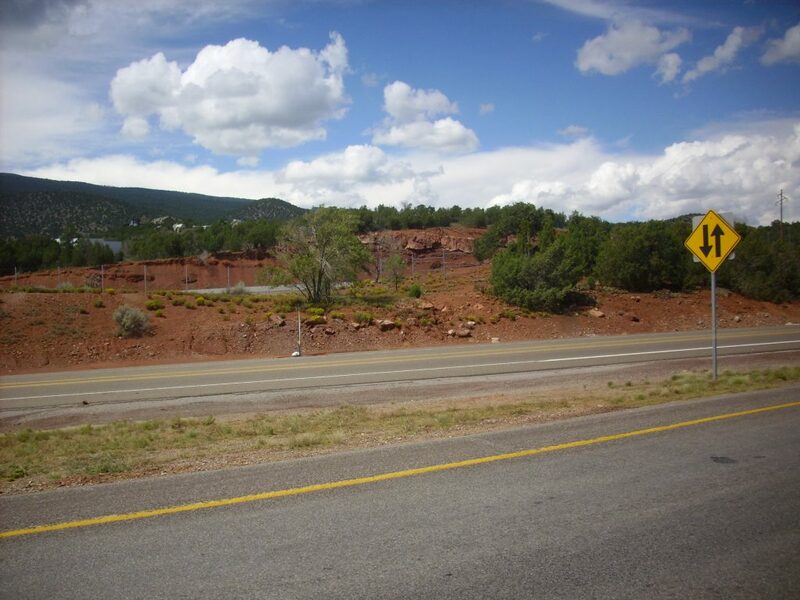 I headed through Tijeras Canyon and took the exit to Cedar Crest, pausing to admire the redbeds. These are beds of shale and sandstone, rich in oxidized iron, of either the Abo or Yeso Formations; my geologic map does not distinguish the two. Either way, they’re early Permian, between about 280 and 310 million years old, if memory serves. 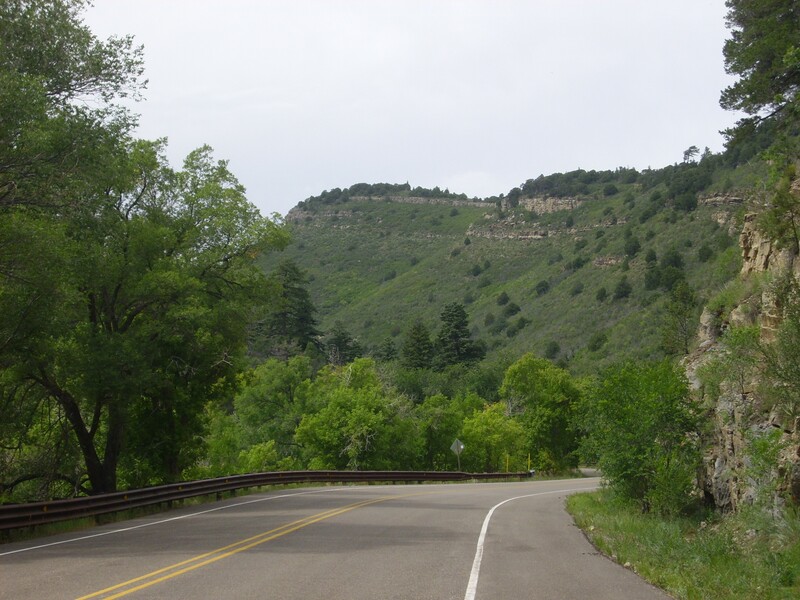 I headed on up past Cedar Crest, looking for Frost Road, which my geologic map showed as passing through a valley with impressive sequences of Mesozoic and Paleozoic beds on either side. I found that Highway 14 was kerbed such that there was really no place to pull over for a photograph, and when I got to Frost Lane, I found that the exposures on either side were poorly visible from the road. Plus I had trouble finding a good spot to pull over and check my map, and ended up getting honked at furiously by a car that came up behind me. On a road with no other cars going either way. Go figure. Anyway, if I choose to come back and explore the beds in the area, I’ll need to make more careful preparations. So I started up the road to Sandia Crest. 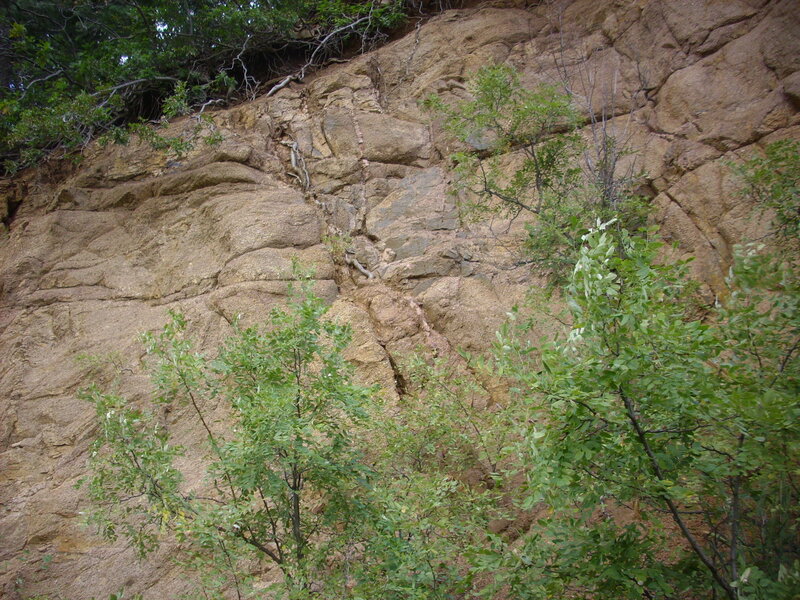 The first spectacular sight was more redbeds of the Abo Formation. 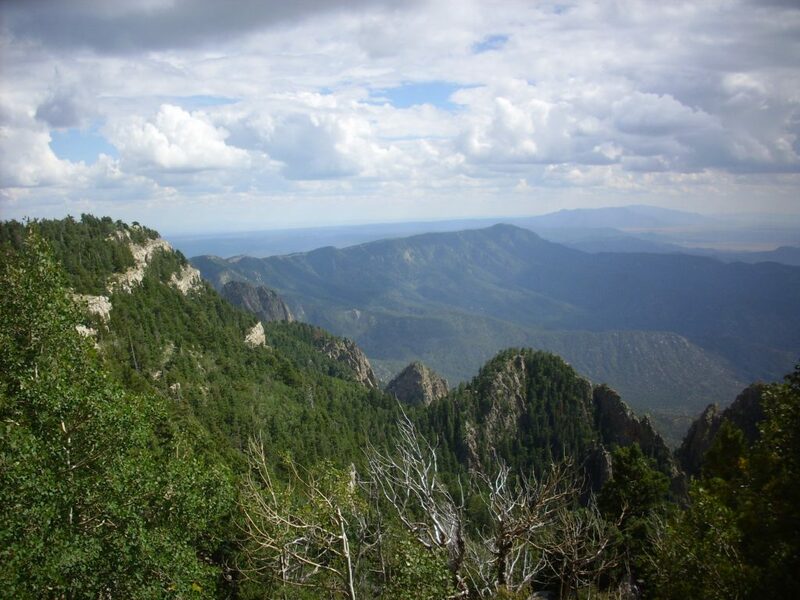 Some background: A large fault lies at the foot of the steep western side of Sandia Crest, which forms the eastern rim of the Rio Grande Rift. 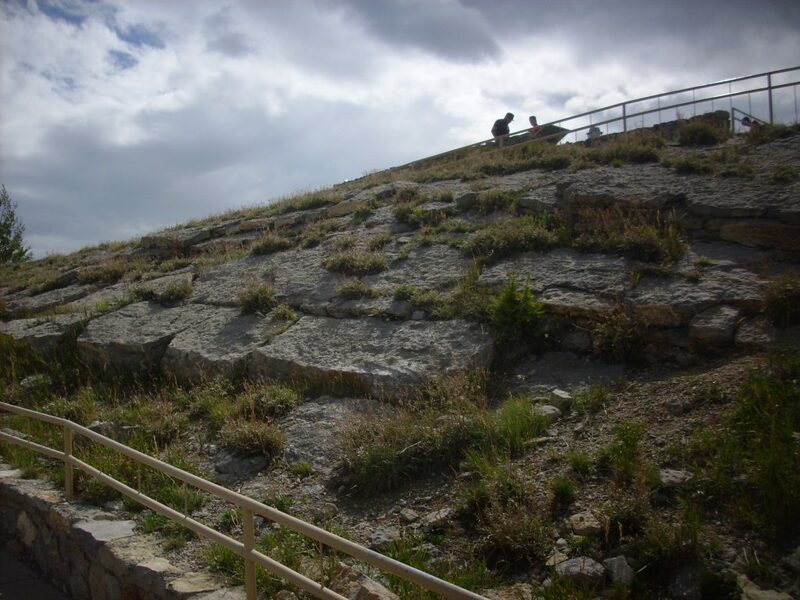 The mountain itself is a large block of crust that has been pushed up on its western side, so that beds that were once level are now tilted to the east. 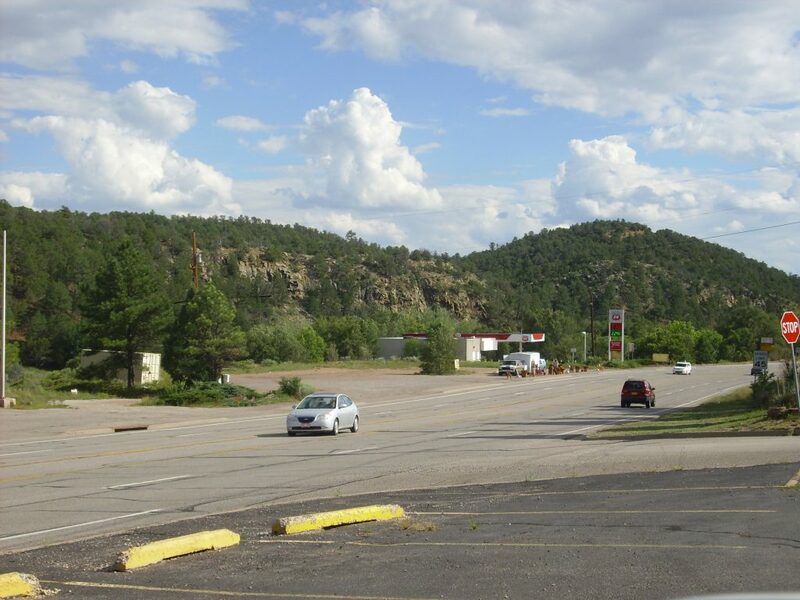 You can see the tilt in the beds in this photograph, with east to the left. The result is that we will drive past beds that are progressively older as we ascend the gentle eastern slope of the mountain. You can also see a microfault in the beds, just about dead center in the photograph. The next formations are Pennsylvanian beds. 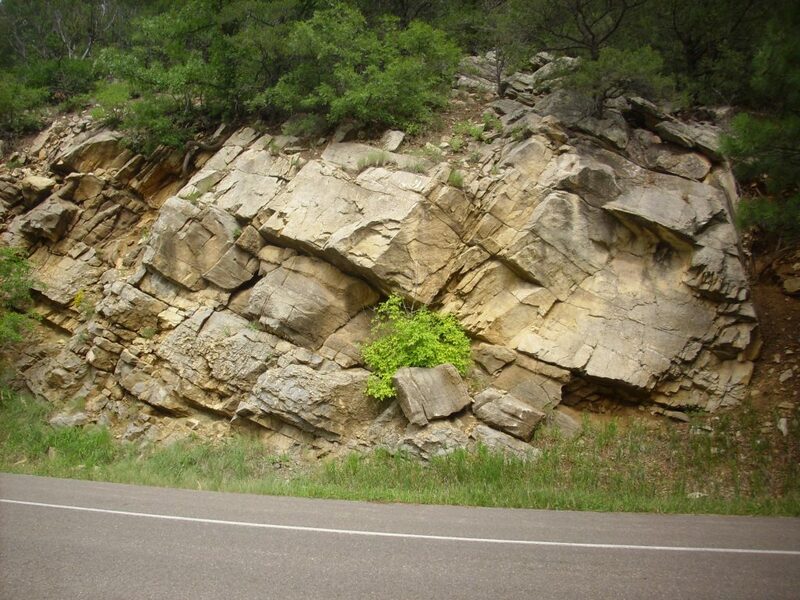 South of where I parked were coarse sandstones or fine conglomerates of the Madera Formation. North were massive limestone beds. 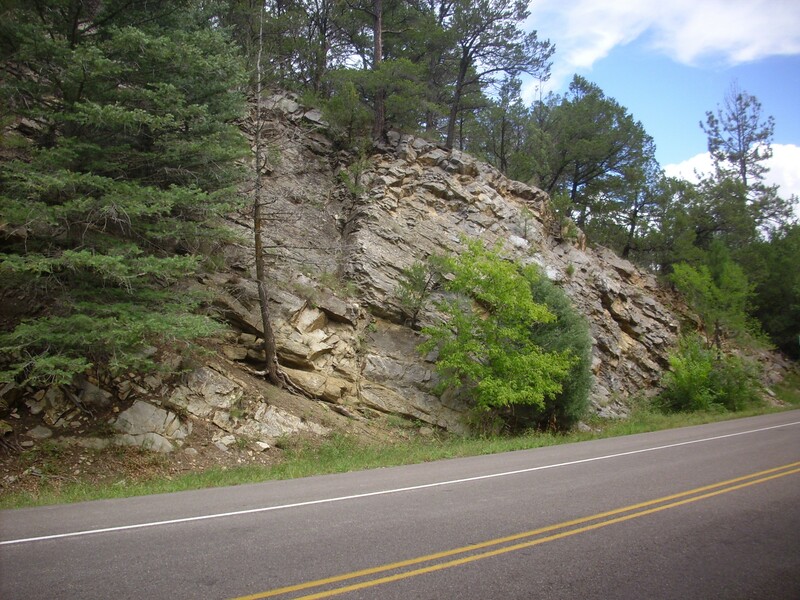 Still further north were thinly bedded shale and limestone that probably mark the transition to the Sandia Formation. Ahead is a view of Tecolote Peak, underlain by Pennsylvanian limestone beds. I pulled over at a good spot for a panorama. The limestone beds show up very nicely. My guess is the upper beds are Madera Formation and the lowermost prominent bed is Sandia Formation. My attempt to get a good pan of the countryside to the east of the mountains from a strategic spot was a bit disappointing. The lighting is poor, and there’s too much foreground clutter. Still. You can see the Sangre de Cristo mountains in the distance on the left, Placer Mountain at center, and South Mountain to the right. Placer and South Mountains are part of the Ortiz porphyry belt, a chain of small mountains that are the uppermost part of volcanic magma chambers that formed 30 to 25 million years ago, just as rifting really got going in the area. The exposed rock is mostly monzonite or syenite, plutonic rocks with intermediate silica content and high alkali content formed by a low degree of partial melting of the upper mantle. In other words, the magma that formed these mountains came from mantle rock that only melted a little, and the part that melted was the part richest in potassium and sodium. The flat area at left is Hagen Basin, which I visited last summer with Bruce Rabe. I wish it showed more clearly here. Then to the crest. I found that a permit is now required to park there. Fortunately, my annual interagency pass was accepted. That’s looking to the south, towards the Manzano Mountains. The foreground left is Pennsylvanian beds and at right is Sandia Granite. 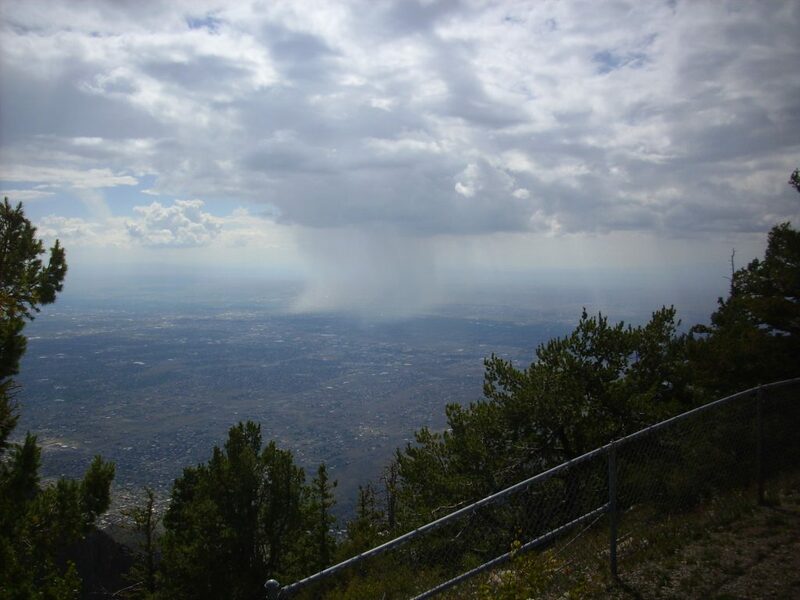 West is Albuquerque, and a rain shaft. was in the way. I actually love technology, but the placement here was awkward. A gentleman offered me his hand …. covered with bugs. The ladybugs were swarming. I’m actually okay with ladybugs, at least as long as they’re not the mutant kind that get into your beans, but this seemed a bit much. Madera Formation limestone beds on the crest. I wandered through the cafe but found nothing diabetic-friendly. On the way back down the mountain, I saw some outcroppings of Sandia Granite that seemed worth a look. 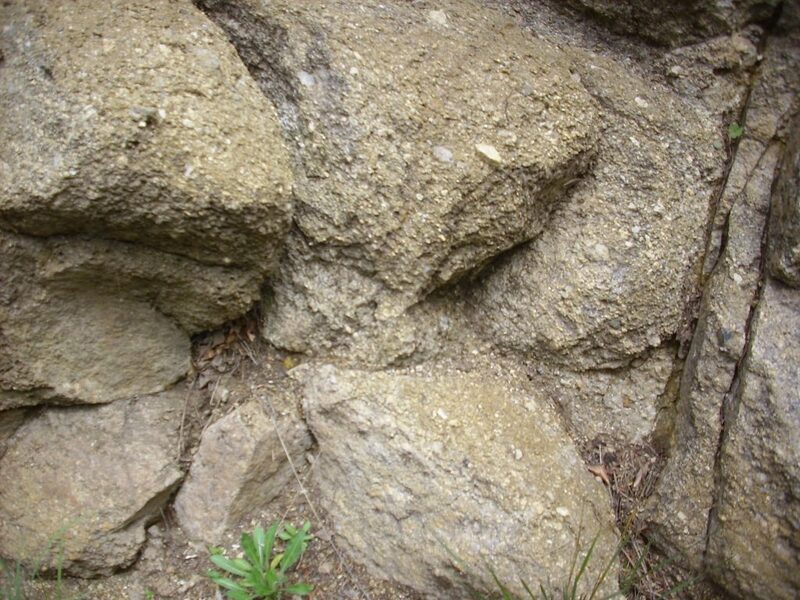 It’s characteristic of a lot of granites that they look good at a great distance or right up close, but look kind of frumpy at middle distances. It has to do with how they weather. But here’s the close-up view. Pretty up close. This particular granite is rich in biotite, which makes it particularly friable on weathering. 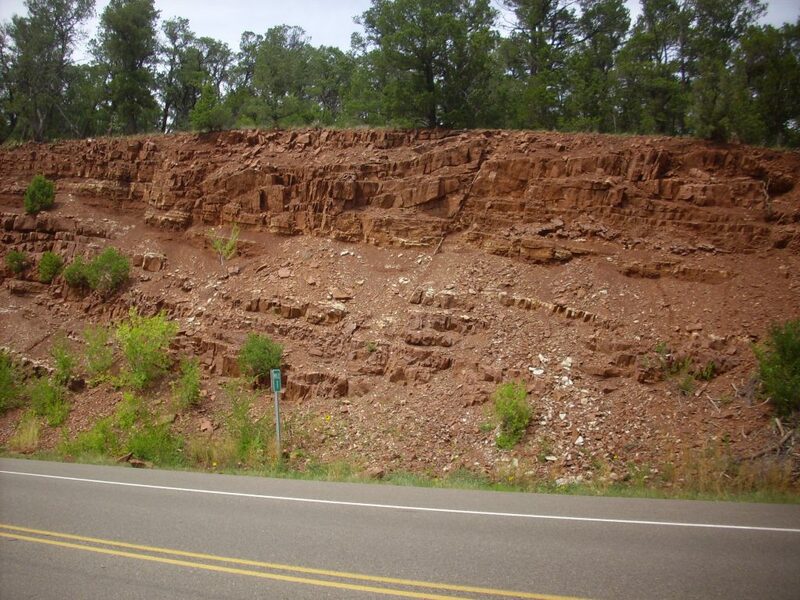 And here is one of the best exposures of the Great Unconformity I’ve seen. This is one for the book. 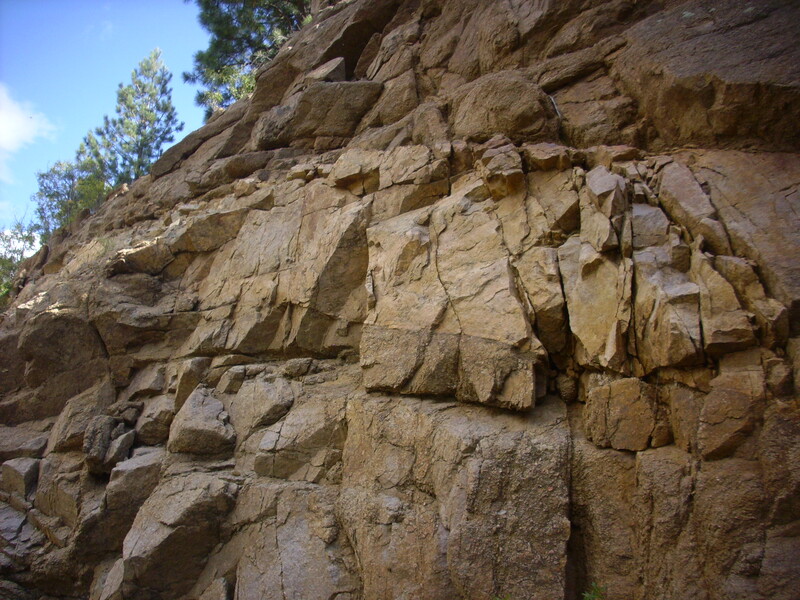 The 1.4-billion-year-old Sandia Granite is overlain by 310-million-year-old Sandia Formation. 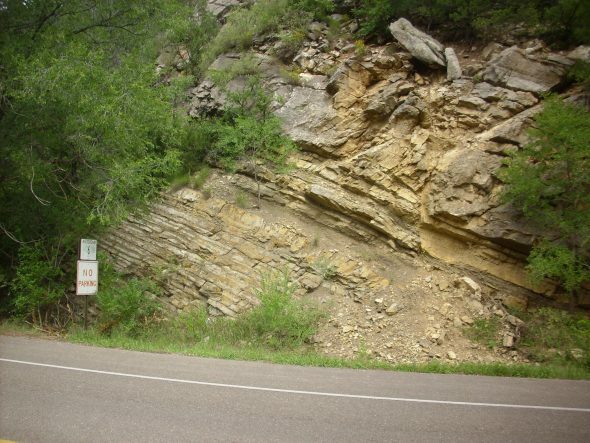 The contact represents some 1.1 billion years of missing geologic history, a gap so widespread in North America that it was dubbed the Great Unconformity. 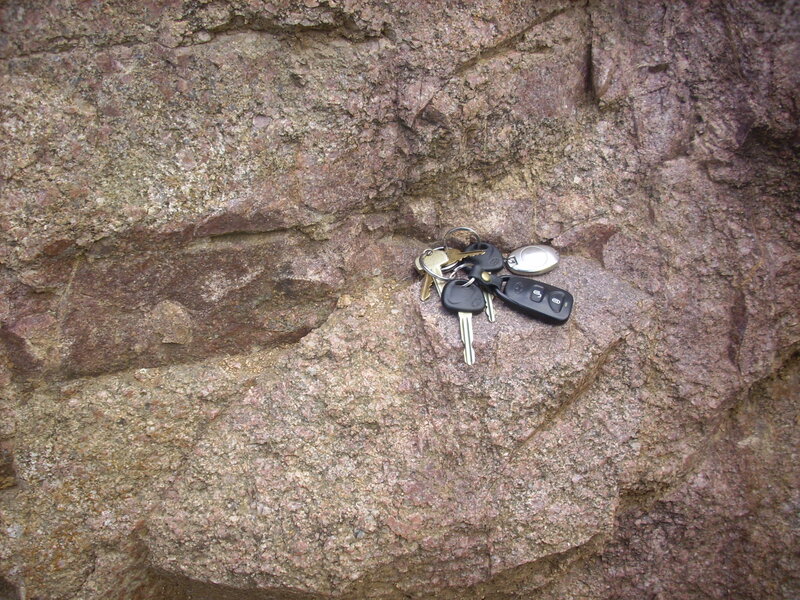 And here’s what appears to be a dike in the granite. 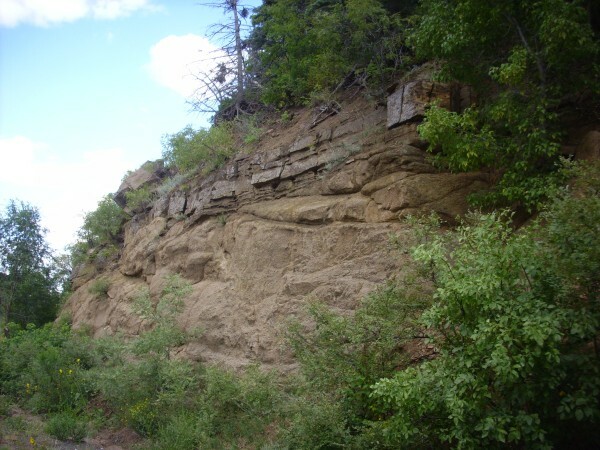 The composition of dike and country rock is actually pretty similar, but the dike is finer-grained. with possibly a touch less biotite. Incidentally, did you hear about the two corpuscles who loved in vein? Driving through Cedar Crest, I found a reasonable spot to photograph the cliffs in the area. I met up with Nathan, who was still deep in his tournament. Ran to the mall, found it rather uninteresting, but bought a few chicken strips to tide me over. Headed back. Nathan was still playing. I found a comfortable chair and read most of my newly purchased monograph on basalts of the Albuquerque Basin. Nathan did well in the tournament. In fact, he qualified for another round the next day, but we were not going to be staying in Albuquerque. Naturally he was disappointed, but didn’t sulk at me too much. The Sandia Mountains are a source of orbicular granite. I don’t know where the outcrops are, though. That would be fairly cool to find. I’ll have to see if there’s anything in the geologic map report to indicate where. Okay, found a paper with a map. 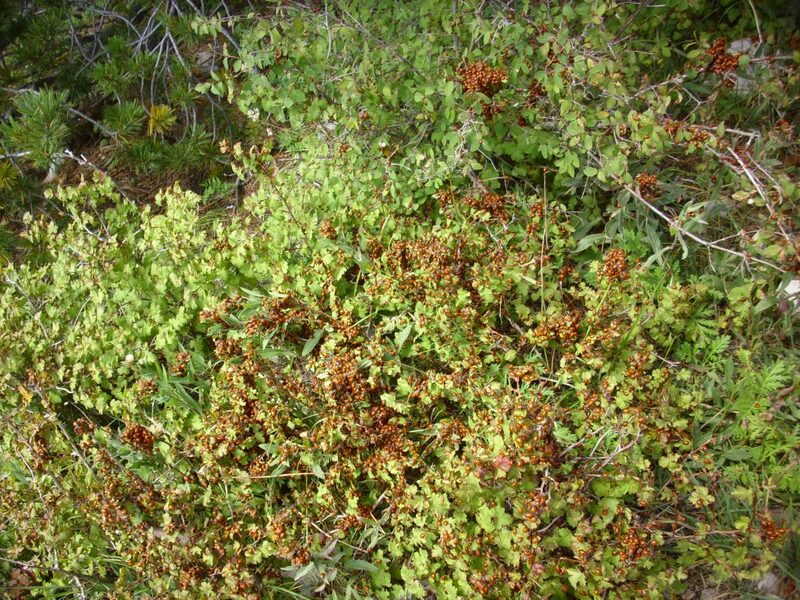 There are five patches of the stuff halfway up the steep west side of the mountain. Kent, could you link to the map? Thanks! 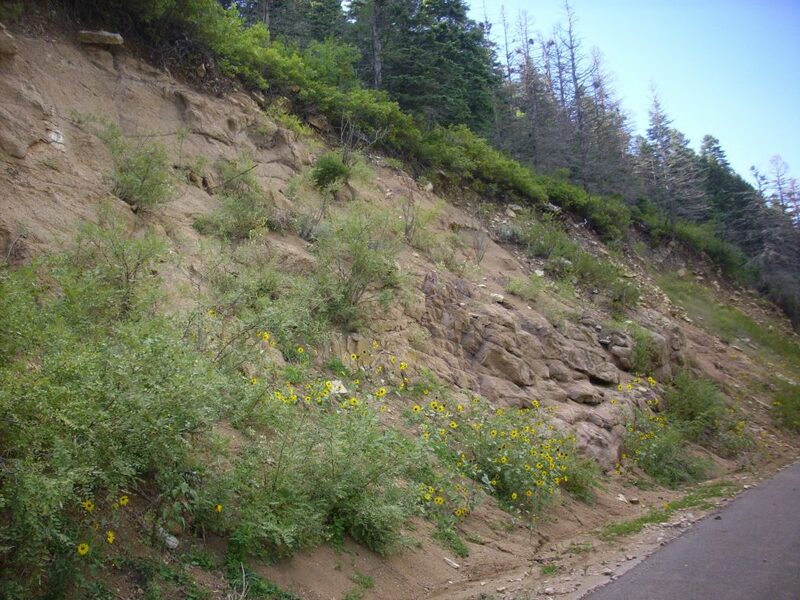 It looks like one outcrop may be accessible from the La Luz trail. However, the maps are a bit vague on just where this is.